Livingston midfielder Kyle Jacobs admits his team simply must win at Alloa on Saturday after two goals in the final ten minutes against Dumbarton condemned the Lions to a 2-1 defeat. With just seven games remaining, Livi are six points adrift of second-bottom Cowdenbeath and Alloa, although the Blue Brazil could extend that gap further with their game in hand at home to Falkirk tomorrow night. After a spirited showing in defeat by Hibs and a well-deserved point taken from Rangers at Ibrox, Mark Burchill’s side were confident of securing all three points against the Sons. The fact is they should have recorded their first league win since January’s demolition of Saturday’s opponents, but somehow contrived to throw victory away. How Livi would take a similar performance when they visit the Indodrill Stadium this weekend – the first in a double header against the Clackmannanshire outfit, with the Petrofac Training Cup final the following Sunday. The 23-year-old came through the youth ranks as a teenager before establishing himself in the first team and was a feature of the side which won the Third and Second Division titles. Keeping Livi up would mean as much for Jacobs as the successive league championships. Striker Ibra Sekajja, seeking his third goal in as many games, was given the first sight of goal against Dumbarton after just two minutes from Danny Mullen’s flick on, but sent his shot wide of Danny Rogers’ left-hand post. Dumbarton forward Garry Fleming should have hit the target from six yards out after Mark Gilhaney’s cross from the left before the Lions took the lead on 13 minutes. Livi captain Jason Talbot was hacked down midway inside the visitors’ half by Chris Turner. Keaghan Jacobs swung in the free-kick and centre back Craig Sives’ backward header took it away from Rogers and inside his bottom corner. Sekajja was then unlucky with a turn and shot which was blocked by defender Stuart Findlay after good work down the left from Talbot to get in the cross, but the former Crystal Palace striker should have tested Rogers with a header from Keaghan Jacbos’ ball into the box. Attacking midfielder Scott Pittman provided the assist for Sekajja in Govan last weekend and he almost set up another with an intricate pass inside, however, Rogers was alert to save with his feet. Livi enjoyed a good spell of pressure early in the second half, with Dumbarton bringing everyone back for a corner kick, but the hosts couldn’t make their territorial advantage count. 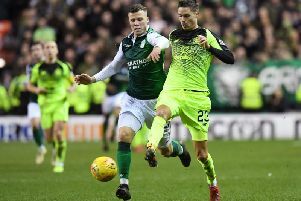 Sons boss Ian Murray took off defender Scott Taggart for striker Chris Duggan with half an hour remaining as the visitors went with three up top. Livi looked set to close the gap to three points on their rivals but were pegged back on 80 minutes when Kyle Jacobs brought down Scott Agnew after conceding possession and the impressive Agnew curled the free-kick round the Livi wall and past Jamieson. Agnew’s terrific effort was matched two minutes from time as Fleming crashed a volley into the roof of the net from 12 yards after the ball broke from a corner. Livingston: Jamieson, Sives, Talbot, Cole, Fordyce, Kyle Jacobs, Keaghan Jacobs (McKenna 46), Gallgaher, Mullen (White 83), Sekajja, Pittman (Hippolyte 77). Dumbarton: Rogers, Graham, Turner, Gilhaney, Agnew, Meggison (Campbell 74), Taggart (Duggan 59), Fleming, Petrie (Easton 23), Findlay, Wilson.